All Products > "401465 Donuts Models Donuts Model California"
Designed by Mirco Pecorari, the California is an oldtimer type aircraft suited to relaxed flying. 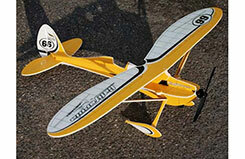 The parasol wing and low weight make it a perfect choice for beginners. Primarily for indoor flight, this Donuts model may be flown outdoors in very calm conditions. Its reduced mass makes the California capable of ultra-slow flight.